The interior of the old cathedral, c. 1880. 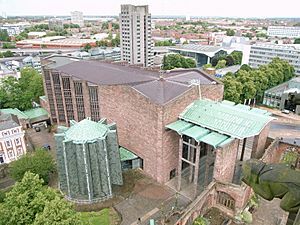 Coventry Cathedral, also known as St Michael's Cathedral, is the seat of the Bishop of Coventry and the Diocese of Coventry, in Coventry, West Midlands, England. The current (9th) bishop is Christopher Cocksworth and the current Dean is John Witcombe. The city has had three cathedrals. The first was St Mary's, a monastic building, of which only a few ruins remain. The second was St Michael's, a 14th-century Gothic church later designated cathedral, that remains a ruined shell after its bombing during the Second World War. The third is the new St Michael's Cathedral, built after the destruction of the former. 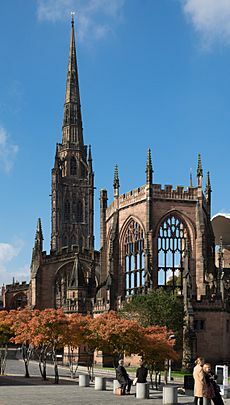 The first cathedral in Coventry was St Mary's Priory and Cathedral, 1095 to 1102, when Robert de Limesey moved the bishop's see from Lichfield to Coventry, until 1539 when it fell victim to King Henry VIII's Dissolution of the Monasteries. Prior to 1095, it had been a small Benedictine monastery (endowed by Leofric, Earl of Mercia and Lady Godiva in 1043), Shortly after 1095 rebuilding began and by the middle of the 13th century it was a cathedral of 142 yards in length and included many large outbuildings. Leofric was probably buried within the original Saxon church in Coventry. However, records suggest that Godiva was buried at Evesham Abbey, alongside her father confessor, Prior Aefic. St Michael's Church was largely constructed between the late 14th century and early 15th century. 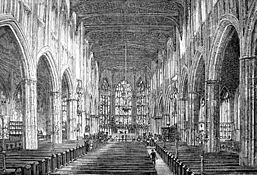 It was one of the largest parish churches in England when, in 1918, it was elevated to cathedral status on the creation of Coventry Diocese. 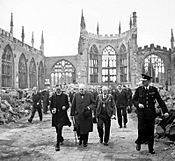 This St Michael's Cathedral now stands ruined, bombed almost to destruction during the Coventry Blitz of 14 November 1940 by the German Luftwaffe. Only the tower, spire, the outer wall and the bronze effigy and tomb of its first bishop, Huyshe Yeatman-Biggs, survived. The ruins of this older cathedral remain hallowed ground and are listed at Grade I. Following the bombing of the medieval cathedral in 1940, Provost Richard Howard had the words "Father Forgive" inscribed on the wall behind the altar of the ruined building. The spire rises to 90 m (295 ft) and is the tallest structure in the city. It is also the third tallest cathedral spire in England, with only Salisbury and Norwich cathedrals rising higher. The current St Michael's Cathedral, built next to the remains of the old, was designed by Basil Spence and Arup, built by John Laing and is a Grade I listed building. 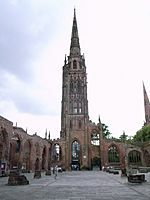 The selection of Spence for the work was a result of a competition held in 1950 to find an architect for the new Coventry Cathedral; his design was chosen from over two hundred submitted. Spence (later knighted for this work) insisted that instead of re-building the old cathedral it should be kept in ruins as a garden of remembrance and that the new cathedral should be built alongside, the two buildings together effectively forming one church. The use of Hollington sandstone for the new Coventry Cathedral provides an element of unity between the buildings. The foundation stone of the new cathedral was laid by Elizabeth II on 23 March 1956. The unconventional spire (known as a flèche) is 80 feet (24 m) tall and was lowered onto the flat roof by a helicopter, flown by Wing Commander John Dowling in April 1962. The cathedral was consecrated on 25 May 1962, and Benjamin Britten's War Requiem, composed for the occasion, was premiered in the new cathedral on 30 May to mark its consecration. 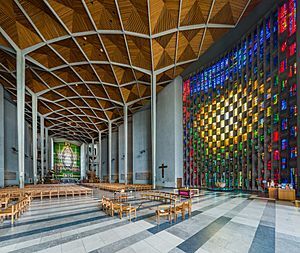 Coventry's modernist design caused much discussion, but on opening to the public it rapidly became a hugely popular symbol of reconciliation in post-war Britain. 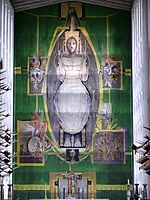 The interior is notable for its huge tapestry (once thought to be the world's largest) of Christ, designed by Graham Sutherland, the emotive sculpture of the Mater Dolorosa by John Bridgeman in the East end, and the Baptistry window designed by John Piper (made by Patrick Reyntiens), of abstract design that occupies the full height of the bowed baptistery, which comprises 195 panes, ranging from white to deep colours. The stained glass windows in the Nave, by Lawrence Lee, Keith New and Geoffrey Clarke, face away from the congregation. Spence's concept for these Nave windows was that the opposite pairs would represent a pattern of growth from birth to old age, culminating in heavenly glory nearest the altar – one side representing Human, the other side, the Divine. Also worthy of note is the Great West Window known as the Screen of Saints and Angels, engraved directly onto the screen in expressionist style by John Hutton. (Although referred to as the West Window, this is the 'liturgical west' opposite the altar which is traditionally at the east end. In this cathedral the altar is actually at the north end.) The foundation stone, the ten stone panels inset into the walls of the cathedral called the Tablets of the Word, and the baptismal font were designed and carved by the émigré German letter carver Ralph Beyer. 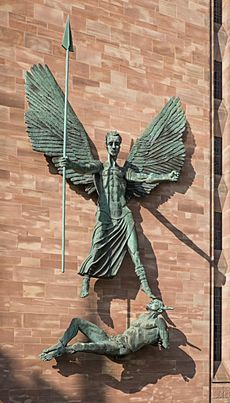 St Michael's Victory over the Devil, a sculpture by Jacob Epstein. As the cathedral was built on the site of a Benedictine monastery, there has always been a gentle Benedictine influence on the cathedral community. A number of the cathedral staff become third order (lay) Benedictines and there are often cathedral retreats to Burford Priory. Since the opening of the new cathedral in 1962 there has been a gentle evangelical emphasis. This has been strengthened by the former Dean, John Irvine, who was involved in creating the Alpha Course and previously served at Holy Trinity Brompton, and also as vicar of the first Brompton church plant, St Barnabas, Kensington. The cathedral has a strong emphasis on the Bible and aims to be a centre for good preaching and training for the diocese. It runs regular mission events such as the innovative Spirit of Life days where over 2,000 local residents are encouraged to explore their faith in God through Christian spirituality. The cathedral is also known for innovation in its services. As well as the expected traditional services (on Sundays, Cathedral Eucharist at 10.30 a.m. and Choral Evensong at 4.00 p.m.), there is a 6.30 p.m. Sunday service with contemporary music, preaching and prayer ministry. The Cathedral Youth Work runs Goth church and Urban Church outreach congregations for local groups of young people, an equipping and supporting cell group for youth workers within Coventry churches as well as a number of other regular groups. There continues to be a strong influence of reconciliation within the theology (both vertical: reconciling people to God; and horizontal: reconciling individuals and groups). This is present throughout the ministry of the cathedral but is most clearly seen in the International Centre for Reconciliation and the International Network of Communities of the Cross of Nails. The reconciliation work exists locally in reconciling churches and community groups but also internationally (predominantly in the Middle East and central Africa) working with terrorists and dictators as well as local churches, tribes and gangs. Justin Welby (then a canon of the cathedral) established a special day for bereaved parents in the cathedral after the death of his own daughter. There is now an annual service commemorating the lives of children who have died. A book with the names of lost children is on display in the cathedral and anyone who has lost a child under any circumstances can ask for their child's name to be added to the book. Cross of Nails donated to the Kaiser Wilhelm Memorial Church. The spire of the original St Michael's Cathedral remains to this day. 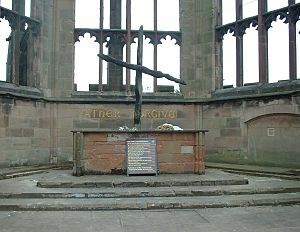 The Charred Cross and the Cross of Nails were created after the cathedral was bombed during the Coventry Blitz of the Second World War. The cathedral stonemason, Jock Forbes, saw two wooden beams lying in the shape of a cross and tied them together. A replica of the Charred Cross built in 1964 has replaced the original in the ruins of the old cathedral on an altar of rubble. The original is now kept on the stairs linking the cathedral with St Michael's Hall below. The Cross of Nails was made of three nails from the roof truss of the old cathedral by Provost Richard Howard of Coventry Cathedral at the suggestion of a young friend, The Rev. A.P. Wales. It was later transferred to the new cathedral, where it sits in the centre of the altar cross. It has become a symbol of peace and reconciliation across the world. There are over 330 Cross of Nails Centres all over the world, all of them bearing a cross made of three nails from the ruins, similar to the original one. When there were no more of these nails, a continuing supply have come from a prison in Germany. They are co-ordinated by the International Centre for Reconciliation. 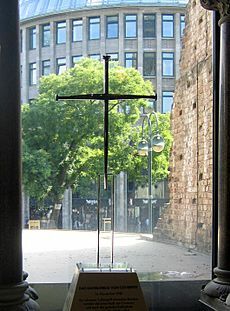 One of the crosses made of nails from the old cathedral was donated to the Kaiser Wilhelm Memorial Church in Berlin, which was destroyed by Allied bombing and is also kept as a ruin alongside a newer building. A replica of the cross of nails was also donated to the Chapel of Reconciliation (Kapelle der Versöhnung) which forms part of the Berlin Wall Memorial. A copy of the Stalingrad Madonna by Kurt Reuber that was drawn in 1942 in Stalingrad (now Volgograd) is shown in the cathedrals of all three cities (Berlin, Coventry and Volgograd) as a sign of the reconciliation of the three countries that were once enemies. A medieval cross of nails has also been carried on board all British warships who subsequently bear the name HMS Coventry. The cross of nails was on board the Type 42 destroyer Coventry when she was sunk by enemy action in the Falklands War. The cross was salvaged by Royal Navy divers, and presented to Coventry Cathedral by the ship's Captain and colleagues. The cross was subsequently presented first to the next Coventry in 1988 until she was decommissioned in 2002, and then to HMS Diamond, which is affiliated to Coventry, during her commissioning ceremony on 6 May 2011 by Captain David Hart-Dyke, the commanding officer of Coventry when she was sunk. 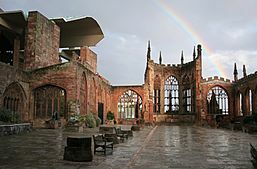 A 1962 BBC documentary entitled Act of Faith on Coventry Cathedral, its destruction and rebuilding, narrated by Leo Genn, was broadcast on British television. The precentor of the new Coventry Cathedral at the opening service was Joseph Poole. The service was televised and watched by many. The cathedral has a pipe organ by Harrison & Harrison dating from 1962. A specification of the organ can be found on the National Pipe Organ Register. Winston Churchill visiting the ruins of the old cathedral in 1941. The surviving tower and steeple, which functions as a working bell tower. Effigy and tomb of Huyshe Yeatman-Biggs, first Bishop of Coventry. Josefina de Vasconcellos' statue Reconciliation in the old cathedral's nave. The baptistry window by John Piper from inside the cathedral. The font, a boulder from Bethlehem. 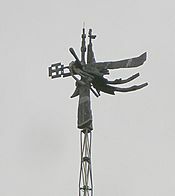 The top of spire of the new cathedral. Chapel of Christ in Gethsemane. To Say Nothing of the Dog (1997), a Hugo Award-winning novel by Connie Willis, centres on an effort to rebuild the second cathedral in 2057. The Facts of Life (2002), a Grand Prix de l'Imaginaire and World Fantasy Award-winning novel by Graham Joyce, following the lives of Martha Vine and her seven daughters in Coventry (where Joyce was born) in the years during and immediately following the Second World War. Nativity! (2009), the film's final sequences were filmed in the old cathedral's grounds. Coventry Cathedral Facts for Kids. Kiddle Encyclopedia.